With most players in the NBA or seniors in college, we we-rank the top 25 of the high school class of 2012. The college basketball landscape changes a whole lot faster in the full-fledged one-and-done era. Hours from now, 60 young men, most of whom spent at least one year playing college hoops, will become NBA players. A handful of them, like Wisconsin’s Sam Dekker and Virginia’s Justin Anderson, were just celebrating their high school graduations three years ago. Believe it or not, they’re two of the last players from their class who will make the jump to the NBA. Just two of the top 10 players from the class of 2012—Kaleb Tarczewski of Arizona and Alex Poythress of Kentucky—remain in college. With that class all but gone from the college game, we at SI.com thought it would be fun to go back and re-rank its top 25. Before we get to the rankings, a few notes on how we settled on the reassembled list. • All players from the top 100, according to RSCI Hoops, were considered eligible from the list. As you’ll see, not every top 25 player made it back into the list three years later. • Only college careers were considered. That means no bonus points for the great season Nerlens Noel just put together for the NBA’s 76ers. • Individual and team success were considered. Shabazz Muhammad had one big season, but UCLA went just 25-10 and was eliminated in the second round of the NCAA tournament that year. Dekker fell short of expectations until his final year in Madison, but the Badgers went to back-to-back Final Fours. Which was better? You’ll find out soon enough. • Players returning for their senior season are eligible. • There were a number of ways to fill the list, and the individual rankings were especially tough throughout. Let us know how we did in the comments. Had Smart left Stillwater after his amazing freshman season, he likely would have been a top-three pick in the 2013 draft, and we’d remember him as a dominant college point guard. Instead, he returned for a tumultuous sophomore season that muddied his college legacy. You probably remember when he shoved a Texas Tech fan, but do you remember that he upped his stats across the board, averaging more points, assists and rebounds per game as a sophomore? Smart’s worthy of the top spot. Noel spent just one year at Kentucky before becoming the sixth pick in the NBA draft. If not for a torn ACL suffered in February of 2013, he likely would have been the top overall pick. A defensive force for John Calipari, Noel averaged 9.5 rebounds, 4.4 blocks and 2.1 steals to go along with his 10.5 points per game. The Wildcats were 17-6 going into the game in which he suffered his injury but went just 4-5 without him and fell into the NIT. Rarely do you see a player at the college level change the game defensively the way he did. Paige has led the Tar Heel offense for three years, providing a steady hand and doing whatever the team has needed him to do on that end of the floor. He averaged 8.2 points and 4.6 assists per game as a freshman, but stepped that up to 17.5 points as a sophomore. Defenses paid more attention to him as a junior, but he still nearly willed the team to an upset of Wisconsin in the Sweet 16. Niang arrived in Ames three years ago as a semi-overlooked player in the class of 2012. He’s still there, and is now the leader of what should be a top-10 team in his senior season. Niang has averaged at least 15 points per game each of the last two seasons, becoming an offensive force on one of the most efficient teams in the country. Niang is one of the primary reasons why the team will be fine without departed coach Fred “The Mayor” Hoiberg. Harris was a central part of Tom Izzo’s offense during both of his seasons in East Lansing. He played nearly 30 minutes per game as a freshman, averaging 12.9 points on 45.6% shooting from the floor. He increased his numbers across the board as a sophomore, going for 16.7 points per game and taking the Spartans to the Elite Eight, where they lost to eventual champion Connecticut. Ferrell has turned into one of the most indispensible players in college basketball, so it’s a good thing for Indiana that he decided to return for his senior season. Ferrell carried the Hoosiers through a rocky 2014-15 season, averaging 16.3 points and 4.9 assists per game and coming up with seemingly every big shot when they needed it. He’ll again be at the helm of the team and could break into the first round of next year’s draft. Stauskas may seem an unlikely candidate to be this high, but given the strides he made in college and the success Michigan had while he was in Ann Arbor, he’s deserving. Stauskas morphed from a pure shooter on a team that went to the national championship game to a do-it-all scorer for a team that was about to make another trip to the Final Four before becoming the second of three victims of Aaron Harrison’s end-of-game heroics. In two years, he went from the 78th player in his class to the eighth pick in the NBA draft. There is just one player on this list who played in one national championship and two Final Fours, and that is Wisconsin’s Dekker. He frustrated Badger fans and Bo Ryan for a large part of his time in Madison, but he came into his own during the best season in the history of the program and was the best player on the floor in wins over North Carolina (Sweet 16), Arizona (Elite Eight) and Kentucky (Final Four). He could be a top-20 pick on Thursday. Harrell barely cracked the top 100 three years ago, but Louisville wouldn’t have had nearly the success it did without him in the paint. He became a beast down low in the last two years, averaging 14 points and 8.4 rebounds per game his sophomore year, and 15.7 points and 9.2 rebounds per game last season. He’s off to the NBA this year, though he may not be better than a second-round pick. Dunn missed large parts of his first two seasons in Providence because of a multiple injuries, but what he did last year was enough to make him a top-10 player in the class. He averaged 15.6 points, 7.5 assists, 5.5 rebounds and 2.7 steals per game, leading the Friars to their second-straight NCAA tourney berth, the first time the program had achieved that feat since 1990. He returns to Providence as one of the best players in the country for the 2015-16 season. • ​​MORE: Which schools & conferences produce the most NBA draft picks? Warren turned into a scoring machine for the Wolfpack during his 2013-14 sophomore season, averaging 24.9 points and grabbed 7.1 rebounds per game. He nearly led the team, a No. 12 seed in the 2014 NCAA tournament, to an upset of No. 8 seed Saint Louis, but it fell in overtime. After barely playing as a freshman, Ellis has been a key player for the Jayhawks each of the last two seasons. He put up 13.5 points and 6.7 rebounds per game as a sophomore and then modestly increased those numbers in his junior season. He’ll be back in Lawrence for his senior year, leading the Jayhawks as they try to win the Big 12 for the 12 straight year. Bennett may have been a surprise as the No. 1 pick in the 2013 draft, but that doesn’t take away from the one season he had at UNLV. He scored 16.1 points and grabbed 8.1 rebounds per game, leading the Runnin’ Rebels to a 25-10 season before they were upset by California in the opening round of the 2013 NCAA tourney. Bennett, of course, landed with the Cavaliers before being traded, along with 2014 No. 1 pick Andrew Wiggins, to Minnesota in a three-team deal that sent Kevin Love to Cleveland. Anderson, a 6’9” point guard, was a star player for the Bruins, leading them to the Sweet 16 in 2014. He averaged 14.6 points, 8.8 rebounds, 6.6 assists and 1.8 steals per game that season, putting up the sort of numbers that really stand out when you’re playing against Power 5 competition. He went pro after his sophomore season and found himself with one of the best developmental teams in the NBA. Cauley-Stein never developed into a huge offensive weapon while at Kentucky, but with all the talent around him, he didn’t need to. Instead, he focused his efforts on being the best defender he could be, and last season anchored what was one of the two or three stingiest defenses of the modern era. He’ll likely be a lottery pick in this year’s draft and can make an immediate impact in the NBA thanks to his defensive presence. After two seasons as a key role player for the Cavaliers, Anderson developed into one of the team’s best players in his junior year. He was their most reliable scorer, averaging 12.2 points per game and shooting 45.2% from behind the arc. Anderson also frequently guarded the other team’s best player. If not for the hand injury he suffered and subsequent appendectomy he suffered toward the end of the season, the Cavaliers would have been one of the most dangerous teams in the NCAA tournament. He’s expected to be a late-first-round selection. Over the last two seasons, Smith-Rivera has turned into one of the best scorers in college basketball. He averaged 17.6 points per game as a sophomore and 16.3 points per game last year, helping Georgetown navigate a challenging Big East schedule. With Smith-Rivera back in D.C., the Hoyas should be a dangerous team next season. 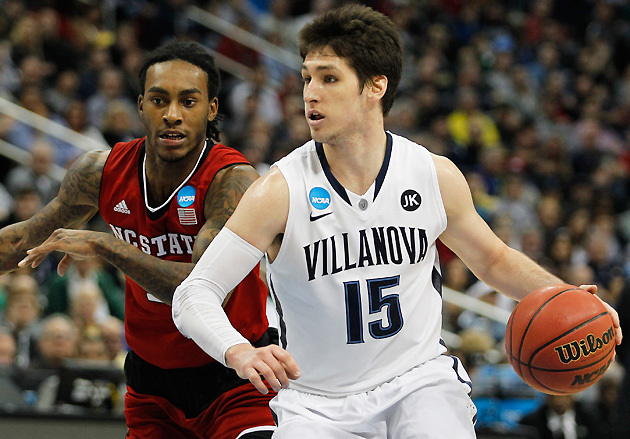 Arcidiacono’s stats don’t necessarily jump off the page, but he has put together a fine college career at Villanova, including winning a co-Big East Player of the Year Award last season. He has averaged double-digit points in two of his three seasons with the Wildcats, and scored 9.9 points per game in the one year he fell short. On top of that, his Villanova teams have gone a combined 82-22, though postseason success has eluded them. Muhammad had great numbers during his one season with the Bruins, averaging 17.9 points and 5.2 rebounds per game while shooting 44.3% from the floor. It’s hard to rank him much higher, though, given that he played just one season in college and his team didn’t have much success that year, getting blown out by Minnesota in its first NCAA tourney game. It was a bit of a surprise when Robinson left Michigan after his sophomore season, especially since the team that was returning to Ann Arbor could have helped him improve his draft stock. Still, he had two strong years with the Wolverines, and was a crucial part of a one of the best pairs of seasons in program history. He averaged 13.1 points per game while shooting nearly 50% as a senior. If not for Ashley’s injury during his sophomore season, it might have been Sean Miller, and not Bo Ryan, who made his first career trip to the Final Four in 2014. Ashley was a two-way force at Arizona, using his elite athleticism to average double-digit points each of the last two years, and at least five rebounds per game in all three of his seasons with the Wildcats. Gathers earned inclusion on this list after posting one of the most impressive rebounding seasons in college basketball history last year. Gathers averaged 11.6 boards per game last year, doing most of his damage in the highly competitive Big 12. He had 25 games with at least 10 rebounds and eight with at least 15, including four in a row. He grabbed an outrageous 28 rebounds in one game against tiny Huston-Tillotson. No matter where he has been, House has been a primary scorer for his college teams. He transferred to Texas A&M before last season and scored a career-high 14.8 points per game. He’ll be back in College Station for his senior year, hoping to lead the Aggies back to the NCAA tournament for the first time since 2011. Tarczewski hasn’t turned into the offensive force he was expected to be coming out of high school, averaging no more than 9.9 points per game in a single college season. Having said that, he has been an important player on a team that has made consecutive trips to the Elite Eight and has won a total of 94 games in three years. He’s probably already crossing his fingers that he won’t see Wisconsin in the postseason during his final year in Arizona. Rozier rounds out the list after picking up the mantle from Russ Smith and saving the team’s offense last season after the dismissal of starting point guard Chris Jones. Rozier averaged 17.1 points per game last season, helping to resuscitate the team when all appeared lost in February. Fortune smiled on the Cardinals, as they made it all the way to the Elite Eight. They nearly advanced to the Final Four without having to play a team seeded higher than them in their region, but ultimately lost to Michigan State. If not for Rozier, they wouldn’t have been anywhere near college basketball’s promised land.